Star Trek: Discovery returns for a second season with the introduction of a mystery that spans the galaxy and the appointment of a new Captain on a temporary basis. The return of this show is something I’ve been eagerly anticipating since the last season ended. Star Trek is my favourite franchise and I found Discovery to be a worthy entry for the most part. Last season wasn’t without its problems but teething problems are to be expected in a first season of anything. Based on the first episode, season 2 is looking to be more confident, energetic and tonally lighter than the previous one. The presentation of this episode suggests that this is a good thing. Last season ended with the Discovery receiving a distress call from the Enterprise and this episode picks up right where that left off with a brief mystery around why the Enterprise is unable to communicate. This is accompanied by a flashback to Michael being adopted into Sarek’s family and meeting her new brother Spock. This sets up a tempestuous relationship between Michael and Spock as shown by his less than welcoming reaction to his new sister. It is further established throughout the episode that a rift exists between them that was never resolved; this makes for an engaging setup as there is built in drama to their relationship that makes for an interesting developmental arc for both Michael and Spock. It also sets up some compelling interactions once they inevitably meet again. One of the strongest scenes in the episode was Michael’s conversation about Sarek where both of them give their takes on how the family dynamic works. Michael asks him what he expected Spock to learn from her and Sarek tells her that Spock was to learn empathy from her to better prepare him for interacting with Humans. Apparently the reverence he had for his mother, Amanda prevented him from learning that from her which doesn’t entirely work as an explanation but it does set up an unresolved tension between Michael and Spock that may end with him understanding the concept of empathy. The flashback scenes are really illuminating when it comes to setting up that fractured relationship. Despite being Vulcan in his way of thinking it appears that he’s jealous of the affection Michael receives from Amanda though there’s no evidence that he doesn’t receive it from her. Emotions are irrational, particularly in children so it’s possible that Amanda wouldn’t show much affection towards Spock as per his Vulcan upbringing. On the surface he would appear to want it that way but it wouldn’t prevent him for resenting Michael for receiving it from Amanda and resenting Sarek for bringing Michael into their family. It’s a compelling setup that has a lot of potential to be explored. Outside of the family drama there is a mystery to be solved that begins with investigating red bursts synchronised at different points across the galaxy. 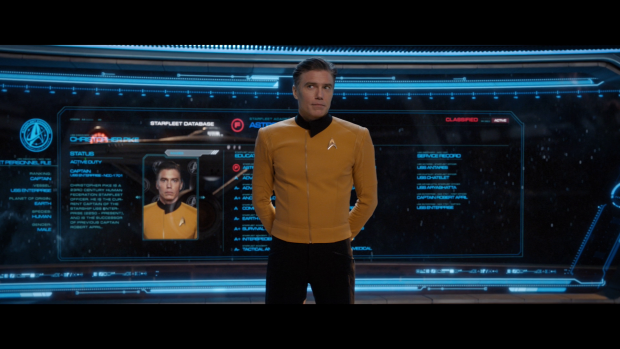 Starfleet assigns Captain Christopher Pike (Anson Mount) as Captain of the Discovery to look into this and learn the purpose of them. 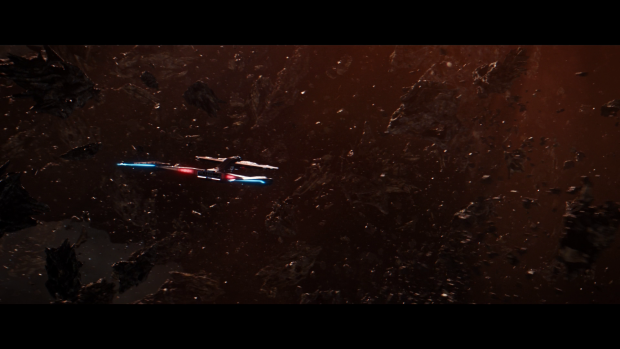 Immediately the idea of this is intriguing as we have a Star Trek show focusing on the crew tasked with exploration. It’s refreshingly old school Star Trek storytelling and it’s executed really well. The sizeable budget this show clearly has is used to great effect to deliver stunning visuals and exciting set piece moments. Another thing that makes it work so well is constant focus on the characters and how this relates to them. Pike taking over as Captain for the purposes of this mission is treated as an awkward situation because the crew aren’t prepared for it and are still dealing with the betrayal of Lorca so may be reluctant to accept a new Captain so easily. Pike is an experienced and level headed leader who understands the situation so elects to approach it head on rather than trying to assert his authority because of his rank. Early on he introduces himself and happily shares his personnel file to prove that approachable. He may be fair minded by he’s far from a soft touch as shown by him making it clear that he is in charge when he is questioned. His stance on dissenting opinions having to come with solutions makes sense to some degree as it stops the discussion descending into something less than worthwhile but it’s also misguided because not all issues will have an immediate solution. Still the approach of listening to the crew and taking their suggestions on board is an admirable quality in a leader. Saru and Pike have a really interesting dynamic. Pike is conscious of the fact he’s taking command of a crew that know and trust their first officer. He respects that accordingly and gives up the Captain’s chair to Saru when his mission is complete without hesitation. Later on when his stay is extended and he changes into the regular Discovery duty uniform there is mention of shared custody which suggests that there will be a collaborative command structure. It could be that this season is about Saru proving himself worthy of the Captain’s chair in the eyes of Starfleet after learning from Pike. Saru is certainly very comfortable in command and knows what the crew is capable of. The mystery of the red bursts is interesting enough but doesn’t receive much in the way of development on its own. Their first lead ultimately proves to be a dead end and not a lot of information is found out through the investigation though there will likely be something that comes from bringing the meteor sample aboard and studying the effects the burst had on it. For now setting up that there is a mystery is enough and it links directly to Spock’s absence since he was studying them before he left. This naturally links it to Michael therefore solidifying the connection between characters and plot in a really organic way. It’s a great start and gives everything equal importance. I mentioned above that the set pieces were really impressive. They were striking in that they weren’t combat focused which ties into the exploration angle. 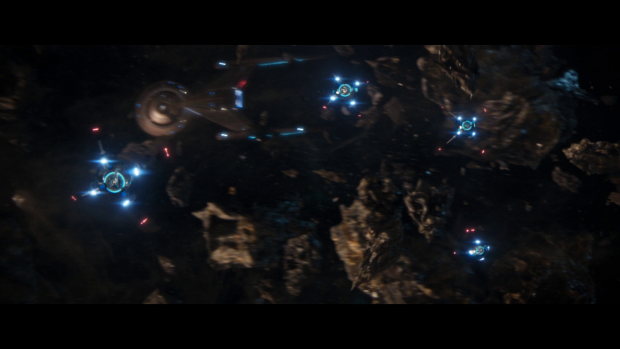 The sequence where the small craft were used to navigate the debris field was reminiscent of similar scenes in JJ Abrams’ Star Trek and the other film I don’t like to talk about though it was different enough and exciting in its own right. The sequence where the debris fragment was collected was similarly impressive and made good use of Tilly in particular. Tilly is as charming as ever with a renewed sense of confidence now that she’s on the command training program. She hasn’t lost her endearing eagerness and unbridled passion either. The concern she shows for Michael going on a dangerous mission was great and her reaction to Stamets announcing that he was leaving Discovery to take on a teaching position to distance himself from memories of Dr. Culber was a really nice moment that takes advantage of the friendship that grew between these characters. 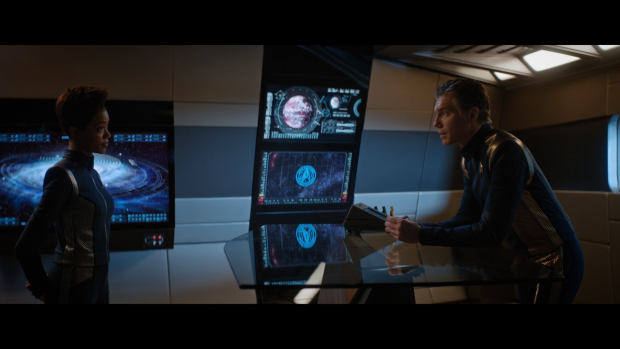 Of course I fully expect Stamets to change his mind but the reasoning behind wanting to move on makes a lot of sense. The episode also delivers a fun guest character in Tig Notaro’s Jet Reno; her dry wit and casually innovative genius made for some hilarious lines. Any scene featuring this character was thoroughly enjoyable and I hope she sticks around for a few more episodes to see how she blends into the crew. Not everything about this episode landed. Pike’s science officer Connolly (Sean Connolly Affleck) was an ineffective pseudo antagonist for Michael through constantly undermining her until his arrogance ends up costing him his life in a clever subversion of the red shirt trope that Star Trek made famous. There were some amusing moments such as Michael correcting him on his misuse of the word metaphor and summing up his assessment of the situation in a more succinct way but on the whole it didn’t work. Michael is already impressive enough without having someone undermine her. If it had been executed better then it could have been a fun rivalry but it was clumsily handled and distracting. A confident, energetic and exciting opening to the season that sets up two engaging mysteries that link to one another naturally. 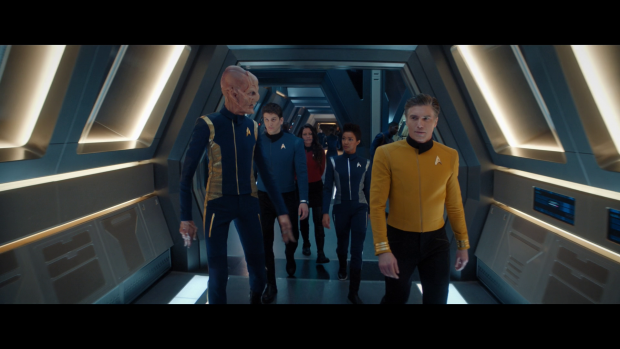 The introduction of Captain Pike is handled really well; taking advantage of the crew’s reluctance to accept a new Captain by doubling down on how approachable and fair minded he is while also making it very clear that he is in charge. Anson Mount is incredible in the role and blends into the cast wonderfully. Pike has an engaging dynamic with Saru as well as the rest of the cast though I’m hopeful that the bridge crew will receive more focus this season on the whole. The absence of Spock sets up the mystery of why he left and what he’s doing while connecting it intimately to Michael who has unresolved issues with her adopted brother. The flashbacks do a good job of showing how affectionate Amanda was to Michael and how jealous Spock was at the time whether it be rational or not. Having this emotional arc link to the red bursts story is a great idea as it keeps everything focused on the characters which makes it forgivable that nothing is really learned through the mission carried out in this episode. The set piece moments in this episode are excellent and tie into the exploration angle that the show is clearly fixated on. There appears to be a tonal shift to a something a great deal lighter than last season and the fact that the set pieces aren’t about combat shows how this can be achieved without compromising the modern desire for action sequences. Tilly remains as charming as ever with her concern over Michael’s safety and reaction to Stamets announcing that he was leaving making good use of the friendships that have been build. The guest character Jett Reno was a lot of fun as well, adding some hilarious lines to the episode. Adding in Pike’s science officer Connolly as an antagonist of sorts to Michael didn’t work as there was no need to try to undermine her in this way. There was some amusement to be had here and there but it didn’t fit with the rest of the episode.